The Immigration Advocacy Project, one of Fordham Law’s public service student groups, received the 2017 NYSBA President’s Pro Bono Service Award for its outstanding volunteer efforts on the behalf of asylum seekers held in a family immigration detention center in Dilley, Texas. Since March 2016, thirty IAP students donated more than 1,000 hours providing aid to Central American women and children at the South Texas Family Residential Center. Volunteer groups, such as the IAP, ensure detained families do not face complex expedited removal proceedings, including credible fear interviews, unrepresented. “It’s a recognition not just of the individual students who put in a week’s worth of time every time we go to Texas but also a reflection of the immense support we get from the Law School,” said IAP co-chair Emerson Argueta of the NYSBA award. Argueta and fellow co-chair Alex Mintz thanked the Feerick Center for Social Justice and Fordham Law Dean Matthew Diller for their extensive and continuous support of the project. The IAP is the Feerick Center’s student partner in planning, recruiting, training, and executing service trips to Dilley. In March 2016, a group of six Fordham Law students made their inaugural journey to Dilley as part of the CARA Family Detention Pro Bono Project. Since then, Fordham has sent three student groups and one alumni group there to work with asylum seekers. While in Dilley, volunteers help women prepare for their credible fear interview, a requirement of U.S. immigration services for those who want to apply for asylum and are subject to expedited removal. If an asylum officer finds an individual to have credible fear of persecution or torture, the officer refers her case to an immigration judge for a full hearing on the asylum claim. “Nothing exhibits Fordham Law School’s motto of ‘In the service of others’ more than helping people who have no chance at representation without us,” Mintz said. From a law school perspective, the IAP’s work is important for two fundamental reasons, according to the Feerick Center’s Bree Bernwanger, who, along with Feerick Center Executive Director Dora Galacatos, has accompanied students on volunteer trips to Dilley. First, the Trump administration’s prioritization of immigration enforcement policies, without offering protections for asylum seekers, is expected to increase the need for services like those the IAP offers. Second, the work prepares a new generation of service lawyers for the challenges of working with a hostile administration and within systems seeking to deny access to counsel. 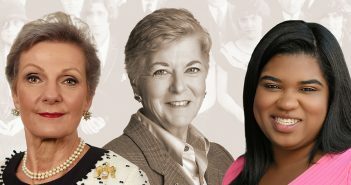 “IAP has shown exceptional leadership, grit, and dedication in responding to one of the most inhumane affronts to due process and American values of our time: the detention of vulnerable, non-criminal, asylum-seeking women and children along the Texas border,” Bernwanger wrote in her nomination letter to the NYSBA. Policies at Dilley have evolved in new and challenging ways in recent months since President Trump’s inauguration. Volunteers are not allowed in the physical space where services are administered unless they have a clear appointment. Changing procedural tactics have provided real world learning experiences for students on how to maintain composure and focus on their objectives in settings where the law is constantly evolving, Argueta noted. These changing tactics have demonstrated the need for even greater volunteer involvement at Dilley. During the last week of March, the IAP, in conjunction with the Coalition of Concerned Students, displayed a large installation on the third floor of the Law School featuring a map of Central America illustrating the geographic and legal journey for asylum seekers; in traveling this route some of the women and children fleeing violence and oppression will ultimately meet Fordham Law students, such as Argueta and Mintz, this August and for years to come.